How many people managed to make it to a game at the old Brockville Stadium in Falkirk? What a bloody hole that was! But in a fantastic way! I used to love it! It was intimate and intimidating and a terrible place for visiting teams to go! 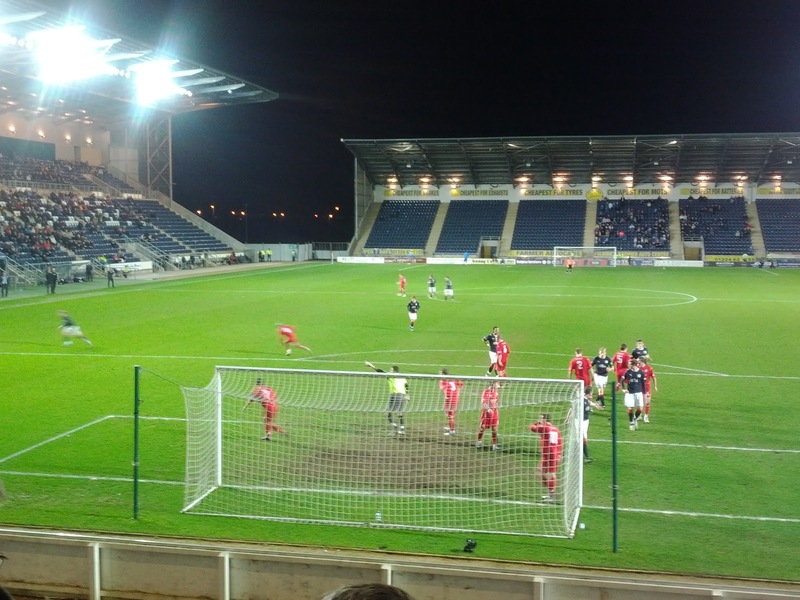 Brockville was the home of Falkirk until 2002/03 - in fact it cost the club promotion to the SPL as it was non-compliant with new regulations. The club ground-shared with Stenhousemuir for 2003/04 (which I forgot!) before moving to their purpose-built new home in the summer of 2004/05. Having enjoyed Brockville, I was hopeful that the Falkirk Stadium would offer the same intimidating atmosphere, intimacy and growl. Unfortunately, it was immediately apparent that it would not. In fact, I was really disappointed by the feel and vibe of the place. There is no doubting that it’s a lovely new ground. The stands are clean and fresh, seats are spacious and it looks impressive. However, there’s just a bit of coldness and soullessness about it. 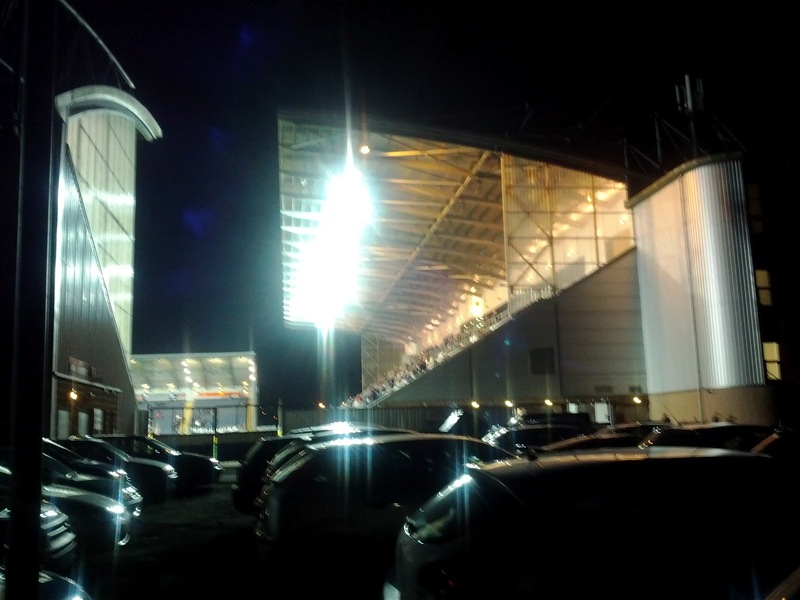 Voices seem to echo around it instead of filling it with the noise and passion that I’m so used to hearing from Falkirk fans both at their old place and…when I’ve seen them away from home. The West (large, two-tiered) and North Stands house home fans, while the South Stand accommodates away supporters. There is no East Stand...just open space. 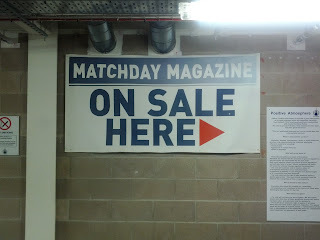 I ended up sitting in the North Stand – the only place that accepts pay at the gate, even though the West Stand was largely empty. By all accounts, you need to pre-purchase a ticket for entry to this end. Makes little sense to me. 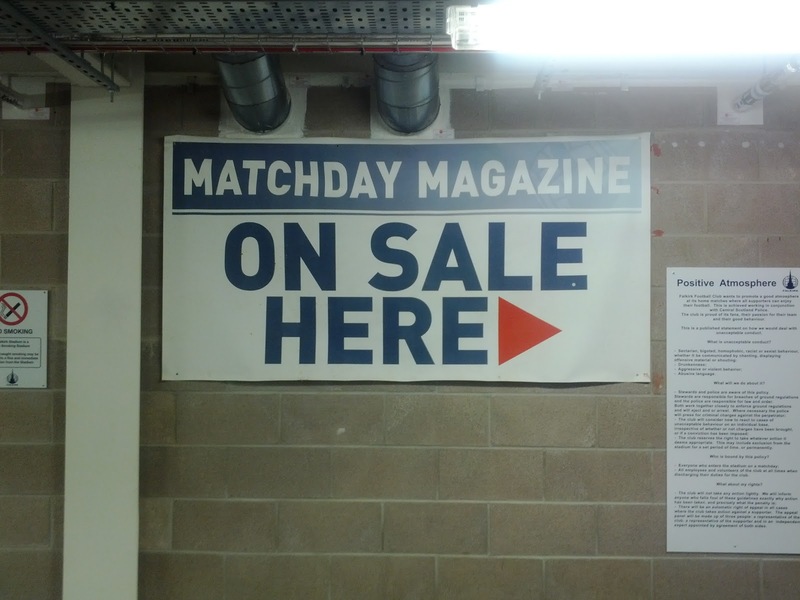 On closer inspection, the Matchday Magazine appears to be pretty rubbish!! The less said about the food at Falkirk, the better. The standard pie and tea came in at £3.60 – only 20p cheaper than Hearts – and tasted horrific. The pie smelt like dog-food and tasted how I imagine dog-food might taste! The tea also smelt like cleaning fluids! I was also ill later that night. Dodge it, people, it’s not worth it! 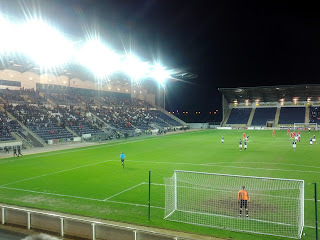 With the exception of a small band of loyal fans in the top right hand corner of the North Stand, there was absolutely nothing coming from the Falkirk supporters. I was unbelievably disappointed as, like I said, on away days they seem to make a fair racket and, at Brockville, they were a bunch of utter mentalists! “Is it still 0-0?” – at this point Morton were 2-0 up. Sadly, the on the pitch stuff didn’t really make it any better either. Again, I came to expect a lot more from Falkirk than I got on this occasion. I watched them at Partick earlier in the season and they were excellent. They played lovely, passing football. They were exceptional on the counter-attack and dynamic across the park. This time round they were flat, struggling for ideas and lacking influence on the pitch. They lost some key men in the transfer window and were suffering from a bit of a mini injury crisis. Nonetheless, the boys on the park were more than capable of giving a lot more than they did against Morton who were the better side from the get-go. In defence, Falkirk looked under threat in behind the full backs. In midfield, they were second to every ball and gave possession away far too easily and up top, were lacking any sort of threat at all in the absence of El Alagui. At this stage in the blog I’d normally single a player out for high praise but, unfortunately, I can’t do that this time. I don’t think any of the Falkirk boys really made enough of an impact on the game to justify special attention. I guess Rhys Bennett (on loan from Bolton) who came on at right back for the second half should receive some applause for his direct running and dynamism, but other than that it truly is slim pickings. 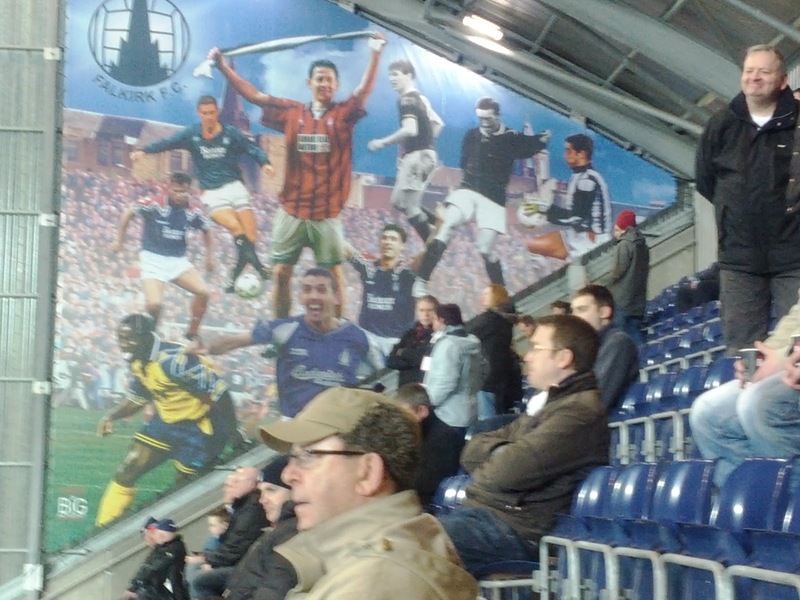 For £16, Falkirk was really poor value. I had high hopes that the Bairns would score well in each category based on my experiences of the club, their fans and their brand of football – from Falkirk of old to the present day. It may be that I just caught them on an off day. I suspect that may have been the case but the nature of this experiment means that I need to judge a club based on my turning up on any given matchday and taking in the surroundings. Perhaps the fact that promotion hopes have now died played a part in supporter apathy. Maybe the players were lacking confidence after Saturday’s loss to Ross County. Maybe they ran out of beef for the pies and just fed me an actual dog. 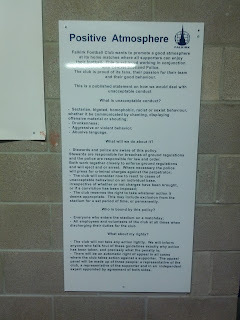 Whatever it was, it wasn’t value for money at all with the Bairns scoring quite poorly in each category and I am shocked to say, now taking their place at the bottom of the supporter experience table! Picked a bad day to come. Season was basically over, was a tuesday night and that was our lowest attendence in the league this season. We also had a cup final the week after. Totally. Suspected I picked a bad night! Just after the Ross Co defeat, before Hamilton game etc. But...in reply to the second post....I agree not a patch on Brockville. Tricky to replicate that sort of atmosphere though, i know, especially in a new ground. The reason it lacks passion and atmosphere is because we have a lot of fake fans. people who say they are supporters but dont go to games unless its a cup final or semi-final. if these "fake fans" came along to the games every home game then we would have a bigger budget and some better players and challege better for league and better chance of winning cups. As a Falkirk fan, I will always compare it to Brockville, and it is nowhere, I suppose it is functional, but too far away from the town.